Please note: this post may have some spoilers of the show My Hero Academia, but I will try to keep it limited! For those of you who may be unaware, I was once a HUGE anime nerd. All throughout junior high and high school, I couldn’t get enough of it, and I devoured the subject like no other; so much so that I started learning more about Japanese culture and learning the language. I was in deep. Then, right before I started college, the love I had for anime slowly dwindled until it was no more than an anecdote of my life. It wasn’t that I hated it, but interests change, and I had started to move onto Western comics and found some other fandoms to love. But in the back of my mind, I would remember fondly how much I adored anime and manga, thinking that I had closed a chapter on my life. That was until a friend of mine recommended My Hero Academia. In the span of two weeks, I have consumed all 3 seasons in one big gulp, and I haven’t felt this in love with a story in such a long time. As someone who consumes media as voraciously as I do, it’s tough for anything to truly win me over, so for a show–especially an anime–to sieze my heart as My Hero Academia has done is quite the feat. For those unaware, My Hero Academia is an adaptation of the manga by the same name, whose story focuses on 15-year-old Midoriya Izuku. Midoriya has always been fascinated by superheroes, and lives in a future where much of the population has powers, called “Quirks”. Some individuals who possess these Quirks work for the government as pro heroes, and it’s become a highly sought-after career. Suffice it to say, many Quirk-gifted people in this universe aspire to be heroes one day, including young Midoriya. However, he is “Quirkless,” meaning he does not hold any sort of superpower. Yet his dream to become a hero leads him straight to the greatest hero of all time, All Might–and he’s looking for a successor. Through hard work, determination, and many sleepless nights, Midoriya trains so he may be worthy enough to uphold the mantle that is All Might’s legacy, and it is no easy tasks. Along the way, he enrolls into U.A. High School, which is Japan’s premier academy for future heroes. Midoriya is taught by the renowned and mysterious Aizawa Shoto, a pro hero who goes by the name of Erasure Head, who is the homeroom teacher in charge of Hero Class 1-A. During his time in the U.A. Hero Program, Midoriya begins to find his confidence with his new gift, forms alliances, makes friends (and rivals), and begins to discover more of his capabilities and strengths. My Hero Academia is the ultimate feel-good anime, and that’s why I love it so damn much. One of the main selling points to My Hero Academia is its cast of characters. For starters, let’s take a look at our protagonist, Midoriya. Midoriya is often bullied for being Quirkless, but that doesn’t stop him from doing what’s right whenever possible, working tirelessly for his beliefs, and inspiring those around him to do their best. According to All Might, he embodies what a true hero, throwing himself into the fray when trouble arises. On top of that, Midoriya is loyal to a fault with his friends, keeping them accountable for doing their best in any situation. Should a need arise, you can bet that Midoriya will be there. You can’t find another character as lovable and endearing as Midoriya. He’s also a crybaby and I can get behind that like you wouldn’t believe. Midoriya is just one of the many lovable, charismatic characters in this show. His U.A. classmates are all fully fleshed out and believable, possess unique Quirks, and go through significant character developments, making for rich plotlines and conflict. I could go on and on about each character in My Hero Academia, but I have to carve out some space for my favorite character: All Might. As previously mentioned, All Might is the #1 hero in this universe. He has tremendous stength, speed, and fortitude. He is all-powerful and can pretty much solve any issue with a well-placed punched and a smile. However, he has a secret that he entrusts onto young Midoriya: All Might has become weak due to an injury he sustained years before, and cannot work as a pro hero all the time. Additionally, he can’t stay in his muscle form for too long, and has to revert back to his true self (whose real name is Toshinori) after using up too much of his power. Throughout the series, All Might becomes a caring mentor to Midoriya, and even begins teaching at U.A. High School. But what I love about him most is that he is exceptionally charismatic, endearing, and isn’t afraid to show his flaws. While in his muscle form, he is the Symbol of Peace and can do no wrong, but when he is not fighting crime he has to develop himself as a mentor, deal with an upsurge in villain activity, maintain his job as a teacher, train Midoriya, and keep his secret. On the surface, he may seem perfect, but he has to work twice as hard to maintain his status as a hero and do good in the world while facing challenges in his true form as Toshinori. To get real deep here: he is the Everyman trying to live his life, make the right choices, and overcoming everyday challenges with a grin. He’s also such a positive presence, and someone to look up to. As I watched the series, I found myself fawning over him, just like the kids he teaches. But the more I watched, the more I appreciated him as Toshinori over All Might (but I still love him either way regardless). Revolving around these characters is a richly crafted plot that provides laughs, heartwarming moments, tension, thrills, and conflict. As the show progresses, we learn about each character in Midoriya’s class, the world that they live in is expanded, and we see the development of various relationships and inner conflicts that arise. At the same time, an underground network of villains works tirelessly to overthrow the trust that the public has placed on pro heroes, attacking where it hurts most and throwing the U.A. 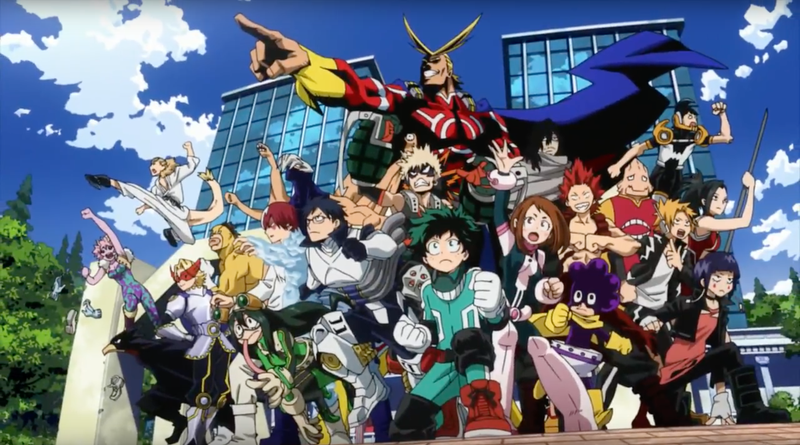 students–including Midoriya–into the fray. What the story of My Hero Academia succeed is the world that has been created to house this story. As stated before, it takes place in the future, where the general public and government have adapted to a population where about 80% of people have Quirks. We see this in mentions of the rules and regulations that have been instilled with the rise of both heroes and villains, and how public servants like the police, fire departments, and medical professionals have learned to work alongside pro heroes in the event of an emergency. We also hear details of internal hero services like costume creation, registration, and licensing. Great attention to detail was practiced when building the world of My Hero Academia to make it as believable as possible for a show about superheroes-in-training, and that is one of its many strengths. Truthfully, it’s hard to pinpoint just one exact reason why I love My Hero Academia because it is such a complex and rich story that supports such lovable characters. But I think it can be summed up in a word I’ve used multiple times already: endearing. This show is so freaking endearing and heart-warming, and every day that I watched it made me so happy I can’t put it fully into words. Its themes of friendship, hard work, determination, and overcoming major obstacles are what resonate with me most, and make me want to be a better person. My Hero Academia is not your typical anime; it is a story that anyone would love, and is sure to make you an anime convert. To put it in the most cheesy way possible, My Hero Academia made me feel happy again. It’s come into my life at a rather difficult time, where I have been dealing with so many stress-inducing factors that I haven’t had the time to think about sitting down and enjoying anything. This bit of escapism was needed and dearly appreciated. I made this to show exactly how I feel watching this damn anime. So, thank you My Hero Academia for bringing to life such a wonderful story, and for rekindling my love of anime. Have you watched My Hero Academia? Are you going to after reading my review? Let me know in the comments down below and we can gush over how amazing it is! Don’t forget to share the love on Facebook, Instagram, and Twitter so we can keep the discussion going! Yuir!!! on Ice is on my list! And yeah, MHA is definitely a must-watch show!